Though tucked away quite a bit up north, many of the venues in Kin Town are worth visiting, and have quite a bit to offer in terms of music and hospitality. This whole street has made an attempt to make American service members feel at home after their big transition to the island. It offers a great mixture of American food and music and Okinawan hospitality. In this issue, we will bring you some of the finest points of interest in Kin. Lately, Kin has been going through a sort of reconstruction, with many of the older establishments being torn down and new, more appealing to the general public being put up in their place. Many people have mixed feelings towards this, including Bobby, manager of The Zone. "I think it's a good thing, but it's a shame to see many of the old artifacts from history go down," he says. "It's important to remember the past and cherish it, but it's more important that we move on." Though it's sad to see many of these old businesses go, this new movement should give Kin a new feel and reputation, and many hope that it will bring many new faces into the area. 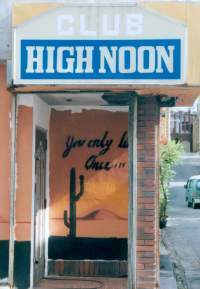 Robbie, manager of Kin's country pub Red Eye, has been on Okinawa for quite a while and has seen Kin, a town humorously referred to as "sinville" in the past, tone down a few notches from what it once was. He is a very calm, polite, and friendly guy and will tell you many fun stories about his past in this small town. According to Robbie, Kin town is the last party town remaining from the seventies and eighties, when B.C. Street -- now known as Chuo Park Avenue -- Kadena Gate 2 Street, and Kinville were lined with clubs and pubs during the Vietnam War era. Many of these streets have been renovated with new businesses, but Kin still has many original bars and nightclubs in place from the early years. "Kin used to be packed. It was like New York City," says Robbie. He said that if you'd spread your arms out vertically and try to walk down the street, you'd run into somebody, where now many of the streets are relatively empty. "All businesses used to be open until 2 a.m. during the week, but now everything closes early," he says. Robbie feels that the generation of club and pub owners during the seventies and eighties has aged, with many of the new generation taking their place, but many of the old owners have made their money, are happy, and are ready to close up shop. Also, the military is much stricter on their Marines than before. "The scene before was just one big party," he emphasizes. "No one ever had to drive, so it was just you and your friends kicking off your shoes and relaxing. Now everyone has to have a liberty buddy." Kin has calmed down considerably since the 70's and 80's. He mentioned a story where recently a guy got in big trouble for falling asleep on the street after a long night of drinking and mentioned, "This sort of thing used to happened every day." Kinville is certainly going through a transition period, or an adolescent stage, as Bobby, owner of The Zone put it. He called it an adolescent stage because the town is going through many changes, trying to find how it would fit in Okinawa. It is in a metamorphosis into something completely different. Many large-scale projects aided with massive subsidies from the central government are changing the town forever. The aim is to breathe new life to the town and make it much less dependent on the base jobs and the dollars U.S. service members bring when on liberty. At the same time the mew jobs are hoped to stem the decline in the town’s population and convince young people that the town is a viable place to live and worth staying. But one thing is for certain: Kinville will always be remembered as a wild and crazy place in the dreams and memories of the many Marines and service members stationed nearby in the past, present, and future. Following are many of the local hot spots to check out while visiting Kin Town. The Zone is one of Okinawa's best-known live houses, and has been host to bands such as Zero Faith, Instigation, Chuck Wow, Noiz as Hell, and The Cylindars. It is an American style establishment, but according to manager Bobby, "the more we do teaches Japanese bars some things, and the Japanese establishments have taught us some things too, such as congeniality." Bobby feels that his customers are family, and you can tell by the way they slap fives and give handshakes that the customers feel the same way. "We are a family," he says. "We all work together to make things happen." Though the customers and employees of The Zone and other establishments in the region have a family type feel, many of the live houses and bars in Kin deal with issues that other live houses in Okinawa City and Naha see less of. "We deal a lot with temporary assignments. Every six months a different set of GIs are assigned here, so things are kind of seasonal. But we always do alright," he admits. "We try to cater to the wants and needs of Americans. We do things American style, period." Bobby is talking about the American style in terms of service. "Basically, you get what you pay for here. We play all styles of Rock and we have a DJ who plays every day and takes requests. Our motto is, 'We take care of our own,'" he emphasizes. "We make sure our customers have a good time and get home safely." The streets of Kin are especially active during the Obon Festival, which is coming up in early September. During this time, various live musical acts play out on the street, and if you stand in the right place you can hear the many styles resonating through one another. Bobby is excited about the upcoming festivities. "It's quite active out here during Obon Festival. It's a good time to come out and intertwine with the cultures," he says. If you get the chance to visit The Zone, be sure to try an Ammo Bowl -- a big plastic bowl filled with mojo and alcohol that serves three people. This house special comes in grape, cherry, orange, strawberry, ice tea, and watermelon flavors and costs only $10 or ¥1,200. "It is by far the strongest and best tasting mojo on island," brags Bobby. If you don't purchase one, it's still quite a spectacle watching three people try to make it to the bottom of the bowl. All of The Zone's drinks come at very affordable prices, with Beer selling for $5 in bottles or $6 for draft, well drinks ranging from $1.50 to $4, and cocktails ranging from anywhere between $5 and $12. Also, the venue has drink specials all week. On Mondays, Beer is $3, on Tuesdays, Tequila Sunrises go for $3, on Wednesday, beer is $1 off regular prices, and on Sunday, Long Island Iced Teas sell for $3. Live bands perform on Fridays and Saturdays, and occasionally, Wednesdays serve as Acoustic Nights. The cover charge for band nights is $5 or ¥500, but the fare includes a free shot, so you're really only paying for a drink. Also, there is a pool table, and it's free to use if you don't mind waiting in line. Bobby notes that they also do a raffle on Fridays and Saturdays with the lucky winners picking up cash prizes. Bobby spoke many kind words of his friend Robbie, manager of Red Eye. "Robbie was the founder. I'm honored to have him up here helping me with Red Eye," says Bobby. "Robbie is just fantastic." The Zone, Red Eye, and a few other venues on Okinawa are all part of one family of live houses, bars, and clubs on Okinawa. In October, a new techno club will open in Kin town called The Underground Bar. This group of people is certainly looking to please everybody. "Make sure you get this in your story," says Bobby. "I'd like to give special thanks to Hansen with their Camp Guard. Thanks for your support, understanding, and patience in dealing with the Marine Corp and civilian policy. I'd also like to thank the base commander for all of the support." Bobby is a nice guy with a lot of heart, and throughout our discussion, he always noted how grateful he was of his helpers, his customers, and the military support. Sun ~ Thu. 7 p.m. - 3 a.m.
For those of you who have been stationed on Okinawa and are missing some of your mom's good ol' home cooked meals, Jenny's Diner is definitely for you. "We cater mostly to our Japanese friends and our returning customers," says Jenny, but everybody is welcome. 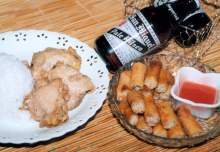 Serving many great Philipino meals at affordable prices, their lumpia is absolutely delicious. Lumpia costs only $5, taco rice and cheese is $5, chicken adobo and rice is $6, the chicken adobo set with lumpia and rice is $7.50, sweet and sour chicken is $6, fried shrimp and rice is $10.50, and the fried shrimp set with sweet and sour chicken and rice is $12. The meals are fantastic and will have you coming back for more in no time. "Everything is home made," says Jenny. Where many restaurants use pre-made ingredients in their food, Jenny's mother makes everything from scratch, including the lumpia sauce. This restaurant certainly has a unique home style feel, and, according to Jenny, "Everyone says, 'Nanai' when they see my mother and says, 'Hi pops!' to my father." Nanai means, "Hi mom!" in Tagalog. The restaurant also has a good, clean, calm atmosphere where anyone can come in and relax. They also bill you for using swear words in their establishment. "The bad word jar has a long history. One guy came in from a bad day and said he was going to have to swear, so we set up a small MCCS mug up and every time someone says a bad word, they throw in a quarter," says Jenny. Eventually, the cup became a full-blown jar, but not because people were swearing more often. "Everyone thinks it's good discipline. We use the money to feed stray animals, so sometimes people even put money in without swearing because they know it's for a good cause." Obviously, Jenny is very kind and giving to animals. She talked for a while about how she'd like to get more involved in helping Okinawa's stray animals, but it's hard to find time sometimes. She currently has many dogs, some of which she has taken into her own home from the streets to care for. Her nurturing spirit doesn't stop with animals though. She is very kind and giving to her patrons as well and makes sure they feel at home at her restaurant. Many of her old military customers have left plaques on the restaurant wall, thanking Jenny's diner for years of friendship and service. One reads, "Jenny's Restaurant for dedication and faithful service to the corps and for being a true friend." Tue, Wed, and Fri 7 p.m. - 11 p.m. Sat ~ Sun 2 p.m. - 9 p.m. Many military members looking for a quick, tasty, American sized meal, frequent the White Kitchen. Over the past thirteen years, they have become famous to both American service members and tourists alike for serving giant hamburgers and other hearty servings. They offer many delicious meals including tacos, taco rice, fried rice, hamburgers, fish burgers, and gigantic baskets of chicken. I highly recommend their chicken teriyaki rice and chicken teriyaki burger, both of which will easily fill even the appetite of a hard working Marine. The prices are fantastic, too! The chicken teriyaki burger costs only $3.50 or ¥350, and the chicken teriyaki rice costs $5.50 or ¥550. 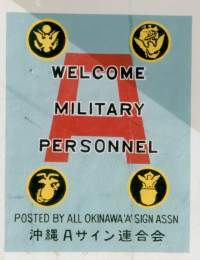 According to mamasan Yukiko Fukuhara, though Hansen and Schwab have a bad reputation for rowdiness, they enjoy doing business with their American customers because the service members have always been so polite to them. Weekdays 5 p.m. - 1 a.m. Weekends 5 p.m. - 2 a.m.
Red Eye is a country bar with a friendly feel. Just over one year old, this pub plays their country music loud and proud. The crowd is somewhat rowdy in a playful way, dancing wildly to their favorite country classics, but they're just out having a good ol' time. This bar has a cozy, comfortable, all-natural feel with wooden walls and floors, free pool, affordable drink prices, and friendly faces. Though the bar hasn't had any live country bands perform yet, they are currently looking to add this feature in the near future. Run by long-term Okinawan resident Robbie, a man who helped establish the well-known country bar/restaurant Western World located close to Kadena Gate 3, this bar has one of the most down-to-earth and friendly managers on island. "Redeye is a happy place," says Robbie. By the expressions on the faces of the pub's visitors, I'm sure Red Eye's regulars would agree. If country two-step or three-step dancing fits your style, you'll surely enjoy this venue. You can also challenge your friends on their arm wrestling table. The next contest will be on Saturday, September 1, with cash prizes of $75 and $25 being given to the first and second prize winners, respectively. If you would like to take part in this event, sign up before 8:30 p.m. the day of the event. There is a $10 entry fee to join the contest. For more information, call 090-3793-6865.